The CareGiver Partnership is giving away two prizes in its May sweepstakes. One helps seniors live independently and safely at home and the other helps them manage incontinence with normalcy and dignity. We’re giving away a prize package every month this year with our “Get Back Into Life” sweepstakes. The prizes this month are a telephone that makes it easy to see and hear callers and a case of premium-quality Poise® Hourglass® incontinence pads. Our goal this month is to make seniors and caregivers aware of how technology can make it safer and easier to age in place, as well as to help the estimated 17 million women who experience light bladder leakage. All participants have to do is e-mail or mail a short statement by the end of May explaining how they or a loved one would benefit from these prizes. Sound-clarifying technology makes words easier to understand. Extra-loud ringer adjusts to 90 dB on base and 80 dB on handset. 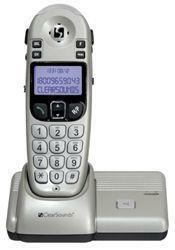 Large, backlit display makes dialing and caller ID easy to see. Visual ringer and vibrate options on handset reduce missed calls. Use on a table or desk or mount on a wall. Prize No. 2 is a case of new Poise Hourglass pads. Poise Hourglass is part of product line designed to help women approach life’s changes with confidence. Designed specifically for light bladder leakage, Poise Hourglass pads have a contoured shape for a better, more comfortable fit, especially for women who carry a few extra pounds. An absorbent core locks away wetness and protects against odors. The Poise Hourglass prize, designed to help customers manage incontinence better than they can with period pads, is valued at $85.99. We’re releasing a series of exciting, informational articles on menopausal issues during the next couple of months, so be sure to stay tuned to our Web site blog as well as our Facebook, Twitter and Pinterest pages. The CareGiver Partnership created the “Get Back Into Life” monthly sweepstakes to raise awareness of products and services that help seniors live independently and make caregivers’ jobs easier. To learn more about the two easy ways to enter and preview upcoming giveaways, visit The CareGiver Partnership “Get Back Into Life” sweepstakes page. Learn more about Poise Hourglass here. ones with answers to their caregiving questions, including information about home health care products and supplies, from our Wisconsin-based team of Product Specialists who are all current or former caregivers. The company’s Web site provides the largest online library of resources on subjects most important to caregivers — from arthritis to assisted living, and Parkinson’s to prostate cancer — as well as access to more than 3,000 home care products for incontinence, skin care, mobility, home safety and daily living aids. The CareGiver Partnership was founded in 2004 by Lynn Wilson of Neenah, Wis. Visit http://www.caregiverpartnership.com to learn more or call 1-800-985-1353. Watch this video to learn how to get a free catalog and $60 in coupons!